Let youth’s imagination flow with the Kid’s Easel with Storage. 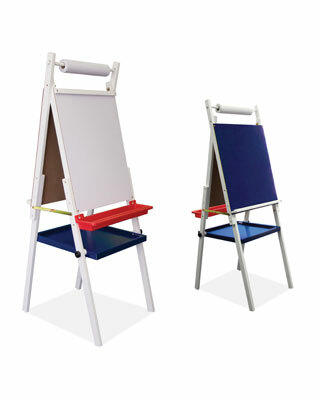 This easel features a dry erase board on one side and a heavy-duty chalkboard on the other. A mounted dowel above the boards holds paper rolls up to 16" wide. A removable paint tray allows you to keep those artistic expressions clean and under control. Can be folded flat for easy storage.